Actually viet welcome them to go their place. most country would love to host it at least 1 time i think. Maybe sg offered to host again? But the 2 bui bui turn it down? Singapore once is enough, one day can finish touring the country. Hope they have a good meeting in Vietnam. Heng ah! Never come Singapore. Singapore did not even volunteer for this round. As usual its down to dollars and cents. Heard if Singapore is to host again, the returns will only be 1/4 of what is from the first round. Anyone getting married can also rent one lah. Communists don't believe in ownership. To them property is thief. Every thing belongs to the state. Edited by Jamesc, 06 February 2019 - 03:11 PM. They had better not volunteer again. My tax dollars will go for fatty Kim’s enjoyment. THE SECOND TRUMP-KIM SUMMIT WILL BOOST NORTH KOREA. COULD IT GAIN EVEN MORE FROM VIETNAM? Maybe bought pre-owned and loan for 20 years? Bui Kim will say not his lar... borrow from his BFF Breasident Xi... like he borrow the 747 the last round. 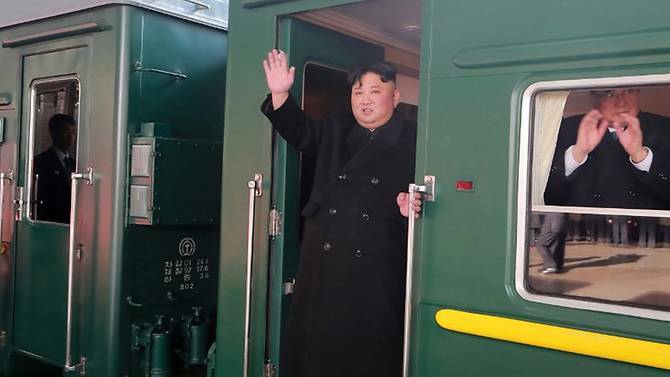 BEIJING: North Korean leader Kim Jong Un's armoured train chugged across China on Sunday (Feb 24) as he headed to his highly anticipated second summit with US President Donald Trump in Vietnam. Emulating his late father and grandfather, who took epic train trips when they were leaders, Kim set off on the long journey from Pyongyang on Saturday. The train crossed the border city of Dandong later that day and was expected to reach Beijing on Sunday morning, according to South Korea's Yonhap news agency and the specialist outlet NK News. The train's crossing into China follows days of speculation over Kim's secretive travel plans, as his team gathered in Hanoi ahead of the talks expected next Wednesday and Thursday. His departure from the Pyongyang railway station was confirmed by North Korea's official KCNA news agency, but the Chinese side has yet to report on what could be a 60-hour journey to Vietnam. Accompanying the North Korean leader was right-hand man and top general Kim Yong Chol, who met with Trump in the White House last month, along with several other top dignitaries, KCNA said. Security was tight before the train's arrival in Dandong, with police cordoning off the riverfront some 100 metres (yards) from the bridge with tape and metal barriers, and leading an AFP journalist out of the area. A hotel facing the bridge was closed for impromptu renovations on Saturday. "The train is long and crossed the bridge slower than the tourist train, but it's definitely him, there's a lot of police presence," an unidentified source told NK News. Windows on the train were blacked out, the source said, with only headlights turned on as it crossed. Kim has previously travelled in his olive green train to Beijing and may stop in the Chinese capital, meeting President Xi Jinping as he did prior to his historic meetings with Trump and South Korean President Moon Jae-in last year. Or he could save the meeting for his return trip to debrief his country's sole major ally. Trump and Kim met in June in Singapore, producing a vaguely worded agreement on denuclearisation, but progress has since stalled, with the two sides disagreeing over what the agreement meant. Kim travelled to Singapore last year on a plane lent by Beijing, and it remained unclear whether he would ride all the way to Hanoi by rail - a nearly 4,000-kilometre (2,500-mile) journey. Another option would be to take the train to Beijing and catch a plane to the Vietnamese capital. But several sources said Kim was expected to arrive in Vietnam by train, stopping at the Dong Dang train station near the China border, then driving to Hanoi. Vietnam previously announced the unprecedented move of closing that 170-kilometre stretch of road on Tuesday between 6:00 am and 2:00 pm -- suggesting Kim could travel on the road between those hours. The Vietnamese foreign ministry said that Kim would "pay an official visit to Vietnam in the coming days", with sources saying he is expected to tour industrial zones in Quang Ninh and Bac Ninh provinces. Rail travel is a family tradition that was started by Kim's grandfather, the North's founder Kim Il Sung, who travelled to Eastern Europe for his longest train ride in 1984. His late father, Kim Jong Il, travelled all the way to Moscow by train in 2001. "It sends a strong message to North Koreans that Kim Jong Un has inherited his grandfather's good qualities, and the Kim Dynasty is stronger than ever," said Koh Yu-hwan, professor at Seoul's Dongguk University. Jeong Young-tae of the Institute of North Korean Studies in Seoul said the safest way to travel would be to take a plane provided by Beijing. "But by choosing to travel by their own special train over a Chinese aircraft, Pyongyang may be signalling its willingness to be independent," Jeong said. "The best route is the Beijing-Guangzhou line," said Zhao Jian, who studies China's railway system at Beijing Jiaotong University, describing a route that would see Kim travel straight down to southern China, before heading west into Guangxi province, which borders Vietnam. Justin Hastings, associate professor in international relations at the University of Sydney, said that would be "a pretty major operation." Hanoi got great KTVs they should hold the meeting there. My bestie Trump love hookers. Not sure if Hanoi got the golden showers type he likes. If only they had this meeting earlier I would have the perfect place for them to meet. Air Force One in Manila. Trump would have felt right at home there. I know what he likes. Edited by Jamesc, 25 February 2019 - 10:58 AM. This is hilarious: Vietnam aren't happy with Trump and Kim look-a-likes being in their country while the meeting is happening.